The compact design of the N300 Micro Wireless USB Adapter makes it easy to connect to your laptop or netbook and go. It's so small you can easily leave it connected to your computer. Connect your computer to your modem or router without any cables. Simply insert the setup CD, run the software setup and plug the adapter into a USB port on your computer, and you’re ready to connect to the Internet from anywhere in your home. Get wireless speeds ideal for surfing, emailing and instant messaging—up to 300Mbps. WEP and WPA/WPA2 security protocols and Wi-Fi Protected Setup (WPS) let you configure and secure your connection. 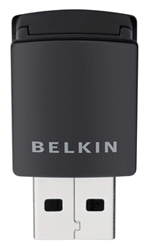 Backward-compatible with 802.11g devices at 54 Mbps and 802.11b products at 11 Mbps, the N300 Micro Wireless USB Adapter can connect to older wireless networks and hotspots as well as newer 802.11n networks and wireless-N devices that offer increased range and speed. *The standard transmission rates—300Mbps, 54Mbps, and 11Mbps—are the physical data rates. Actual data throughput will be lower.